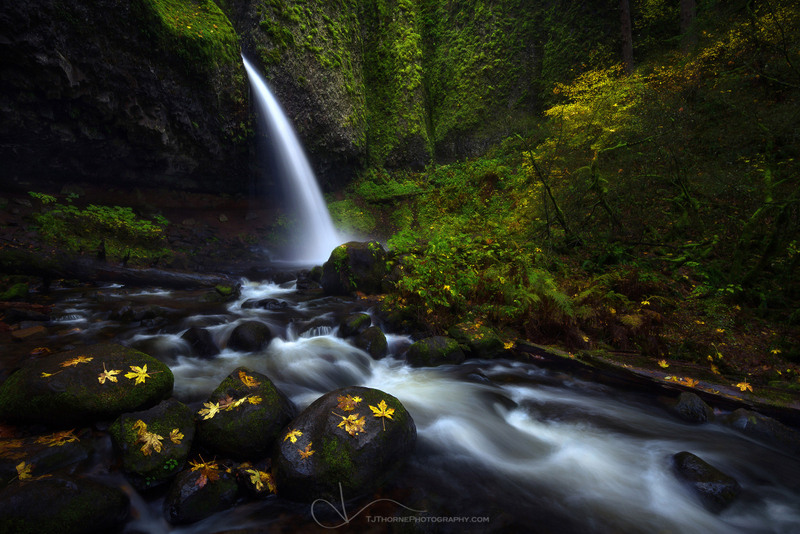 Autumn leaves dot the landscape at Ponytail Falls in the Columbia River Gorge, Oregon. Ponytail Falls is one of the more popular and easy to access waterfalls in the Columbia River Gorge. This is yet another waterfall that I had really wanted to feel that I did it justice. I've shot it many times but have never released a shot until now. I shot this as a test shot during my Autumn Wonders of Oregon Workshop in 2015. It was the tail end of the long and tiring workshop and I honestly wasn't even in the mood to shoot.. so I wasn't shooting this with intent to release it. Only after I had processed it during the post-processing instruction portion of the workshop did I actually fall in love with it and feel like it was a shot I'd like to have in my portfolio. I'm very grateful that I have the opportunity to visit these locations as often as I'd like. It allows me to focus on the scene differently each time and gives me more reason to wait for a shot that resonates with me.